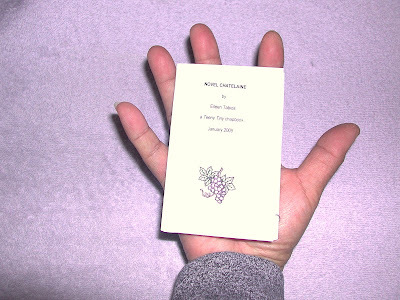 Poet Eileen Tabios becomes a novelist with her first published novel: NOVEL CHATELAINE (TeenyTiny Press, Washington, 2009). Yay! WOOT! I'm delighted to announce that SILK EGG: COLLECTED NOVELS (2009-2009) has been accepted for publication by the illustrious Shearsman Books of Exeter, U.K. Publication Date: Spring 2011! SILK EGG, of course, began with the first novel Novel Chatelaine! The book will present a dozen novels! More details, no doubt, to be forthcoming! Novel Chatelaine Inspires Poem by Jeff Harrison, first posted on WRYTING-Listserve. Novel Chatelaine is also part of a larger manuscript entitled SILK EGG: COLLECTED NOVELS. The title novel "Silk Egg" has been published in the Fall/Winter 2009-2010 Issue of Cerise Press: A Journal of Literature, Arts & Culture, and can be read without cutting a tree OVER HERE! UPDATE: "Silk Egg" has been nominated for BEST AMERICAN SHORT STORIES and BEST OF THE NET! Another novel from SILK EGG entitled Christmas is now available as a booklet from Dan Waber's tiny series from chapbookpublisher.com. I have written thousands and thousands of pages attempting the novel. I have spent years now attempting the novel. Except for the rain forests that I've decimated (sorry sorry sorry to Nature! ), it's not a wasted effort as one improves with practice, and also because I've been able to recycle some of the better chapters (within failed novels) into short stories. But, still, I've spent years failing at the form of novel....until now! It is being published by the fabulous and, more significantly, very charming Teeny Tiny Publications published by Amanda Laughtland. And, yes, as the picture shows, it's tiny (intimate) enough to nestle lovingly on your palm! Kudos to Amanda's book design--in Ron Silliman's words, "Seven chapter, 8-page novel with great color graphics ingeniously printed on a single [8 X 11"] piece of 20-lb weight copy paper." It began with the recollection of a blue silk pocket. From which an iron key fell. Which made her purr, "Well hello you 17th Century…!" which I have faith shall be forthcoming....! I'm so happy! Moi novel inspired the fabulous poet Jeff Harrison to pen a poem, which he shared with the WRYTING-listserve (hence I heard about it!). Here's his poem -- and thanks Jeff! from your horns: light once more!